After years of neglect and isolation, a senior dog is starting a new chapter of his life at the age of 15. It began when his previous owner brought him to Southeast Volusia Humane Society's (SEVHS) emergency animal drop-off in New Smyrna Beach, Florida, around 2 a.m. in early November. The shelter workers knew nothing about the dog other than the two pieces of information the owner scribbled down on a note. His name was Max, and he was 15 years old. His body told the rest of his story. His toenails had grown so long that they were curling back toward his paws, and he had a skin condition indicating that he hadn't seen a vet in at least 6 months, probably longer. His entire body was emaciated, and he hadn't been adequately fed or cared for in quite some time. Max's demeanor revealed yet another horrifying part of his past. In the way he shied away from humans and other animals, the shelter workers could tell that he had been living in isolation, cut off from relationships and affection. Luckily, Max wasn't even at the shelter for a week before foster parent Jared McKenney, photographed above, offered his home to Max along with proper medical attention and "lots of TLC," McKenney told The Dodo. When he first brought him home, Max seemed to not know what to do, explained McKenney. "He didn't know what the inside of a house was," but it didn't take long for Max to learn the comforts of a loving home. At first, McKenney was able to wrap his hands around Max's waist, but after spending several weeks with McKenney, Max's health has started to improve. His skin's clearing up, his hair's starting to grow back and his waist is bigger than two hands around. But it's his spirit that has shown the most improvement. Despite being tired from living in neglect for months and likely years, Max has learned to show love and affection for the people and animals around him. McKenney brings Max out to dinner to a local restaurant that allows dogs on the outdoor patio. "I have him sit there while I have dinner, and he gets to meet people and other animals," said McKenney. A recent trip to the vet confirmed Max's improvement. He wagged his tail as he walked through the door, and the vet told McKenney that Max has "still got a lot of life to live." He's no young, spry dog. 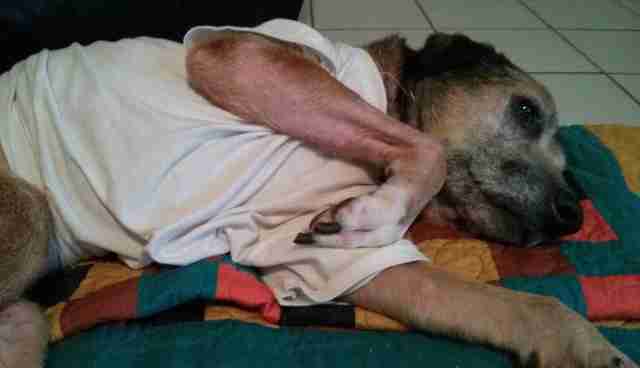 His age keeps him moving slowly, but just the simple act of interacting with dogs and humans has marked a new beginning in this elderly dog's life. Max is still searching for his forever home. One with young children and people who enjoy slow walks would be ideal for Max, says McKenney, who will continue to foster Max as he heals for about another month or two. Visit the SEVHS website to learn more about adopting Max or the many other dogs in need of a home. Additionally, consider donating to Max's Heroes fundraising page. Although they've already raised more than enough money to pay for Max's medical bills, they will be donating all the extra money back to support SEVHS.